There are a number of misconceptions out there when it comes concrete construction. Some concrete strengthening companies cut corners while others fail to use the latest techniques and top-of-the-line technology. There’s no question that you want the project done right the first time. That said, let’s debunk some of the most common industry myths. Concrete is impermeable – Here’s the deal: even the densest concrete is somewhat porous. It can take anywhere from a few minutes to a few months for water and other substances to pass through concrete. You just never really know. To combat the issue, a company may choose a combination of chemical admixtures, as well as surface treatments such as sealers and membranes. Concrete’s strength and durability go hand in hand – Not necessarily. Concrete generally deteriorates because of corrosion of reinforcing steel, exposure to freeze-thaw cycles, and sulfate attack, among other natural events. It’s important to know that the key to durability is reducing permeability. Concrete can be placed on frozen ground without any issue – This is a topic of conversation in many areas, but especially in Colorado. The short answer is that precautions must be taken to protect concrete and protect future soil problems in less-than-ideal conditions. Simply put, concrete placed on a frozen subgrade may settle unevenly when the subgrade thaws. Not surprisingly, this leads to cracking. Concrete that is flat and level after placing will always remain flat and level – Unfortunately, this isn’t factual either. The truth is that concrete will change in volume while setting, hardening, and drying. Slab edges that curl come about from differences in the moisture content and temperature at the top and bottom of the slab. Reinforced concrete won’t crack – Most people don’t realize that structural reinforcement is meant to hold the cracked areas together. As explained on Concrete Construction, “When concrete cracks, the tensile stress is transferred from the concrete to the steel.” This is what allows reinforced concrete to hold up against higher tensile loads than concrete alone. Is your commercial space in need of concrete restoration? Then you need to find a reliable company that can handle the project. McDonald Waterproofing & Restoration has been serving the Denver metro area for two decades. What makes our team different is that we focus on delivering long-lasting solutions in the most cost-effective manner. Never will we use a “one-size-fits-all” or “band-aid” approach. Today, McDonald ranks as one of the top specialty repair contractors in the state. You can count on us to do everything from concrete replacement to concrete crack repair and everything in between. We aren’t about treating your project like a number, either. Our staff takes great pride in client satisfaction and innovative communication process. We understand how intimidating concrete repair can be. Not to worry, though. We try to keep things simple and walk you through the entire process. At McDonald Waterproofing & Restoration, honesty, friendliness, and quality are always top of mind. 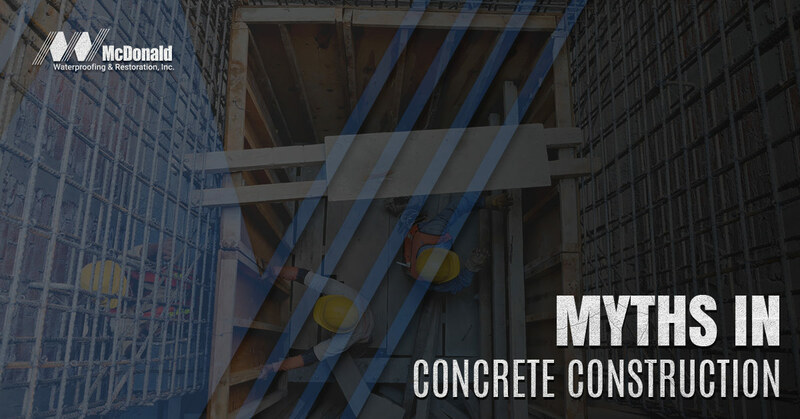 Don’t be tricked into believing any of these or other concrete construction myths. Contact us today to get started with your project.